City Car Racer - Играть бесплатно на PacoGames.com! All friends of high octane racing, beware! City Car Racer is a physics based endless racing game against traffic. 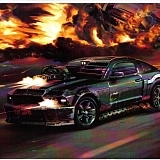 Dodge traffic vehicles at high speeds on highway, become a traffic racer, earn big scores, drive and upgrade your car! Are you ready to prove your driving skills to be a professional driver? Do you see that police car right in front you? Should you overtake and break the rules, or should you stay low profile and drive slowly? You know what brings more adrenaline to the game! Choose your car, pedal to the metal, and be the fastest highway traffic racer ever born! Have fun.